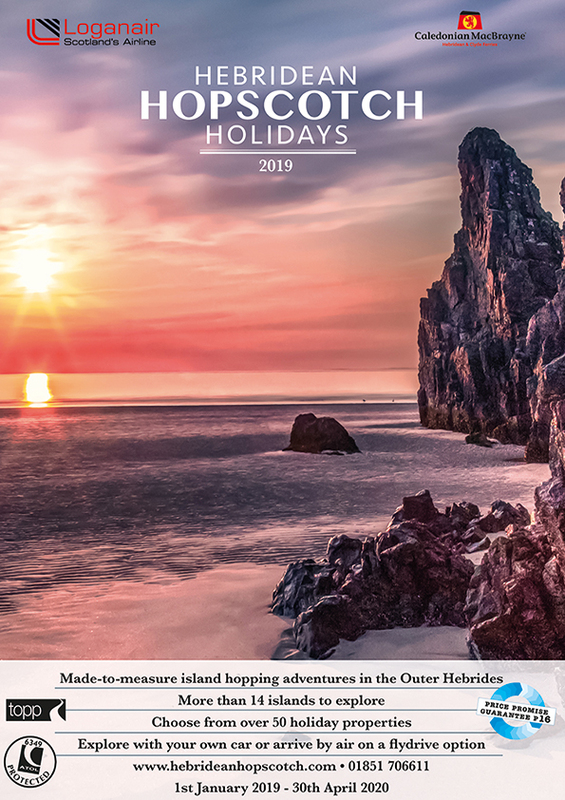 White shell-sand Atlantic beaches, flower strewn machair on the west coast and moorland stretching to the rugged east side, you are sure to enjoy the beauty of these islands. If you’re travelling south, Benbecula (Beinn na Faoghla) and South Uist follow North Uist. If you travel straight down the main road from Benbecula, you’ll be in Eriskay in 45 minutes. So make some turns from the main road and discover interesting aspects of the Hebrides that could fascinate you for several days. 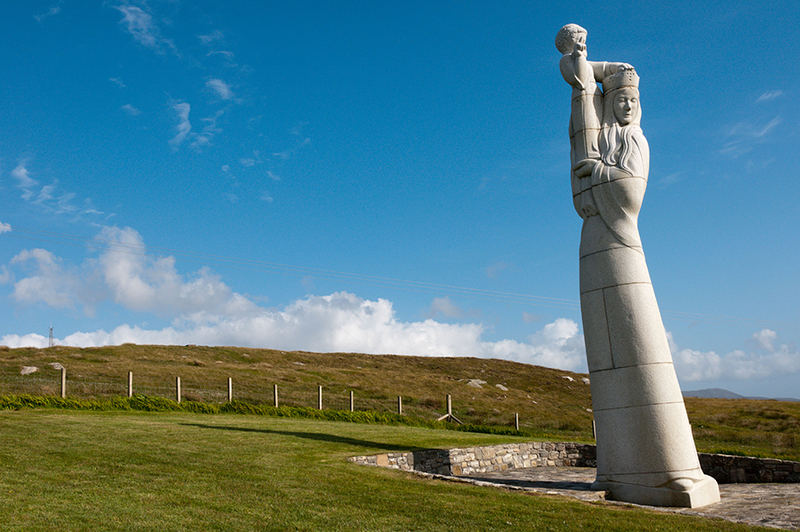 Balavanich is certainly the the commercial centre of Benbecula and the Uists, but that really means a smattering of shops for essentials, Stepping Stones restaurant*, Chinese takeaway*, filling station, hospital and an airport offering services to the mainland. There are also a few shops selling local products of interest to visitors, including tweed. Benbecula is a very small island, where you may try a round of golf, perhaps, or explore the local heritage at the iron age fort at Nunton Steadings. There’s a long stretch of white-sanded Atlantic beaches on the west coast around Shell Bay and Culla Bay. 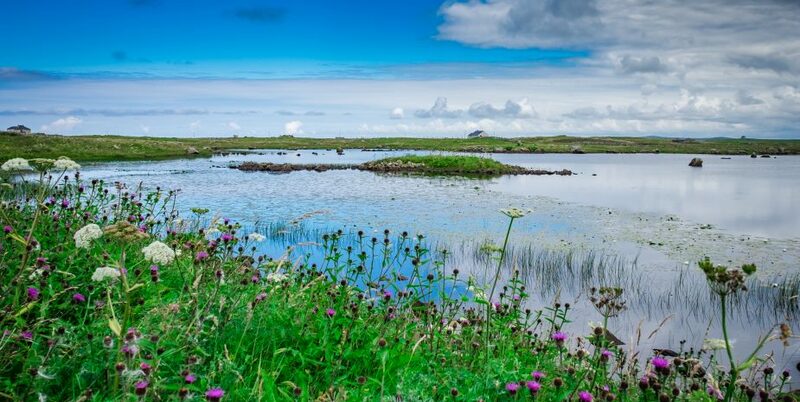 South of Benbecula, the Isle of South Uist – Uibhist a Deas – seems somehow softer and greener than the islands to the north, with a central, hilly spine. There are stunning white shell-sand Atlantic beaches and flower strewn machair on the west coast, while the east side is more rugged. 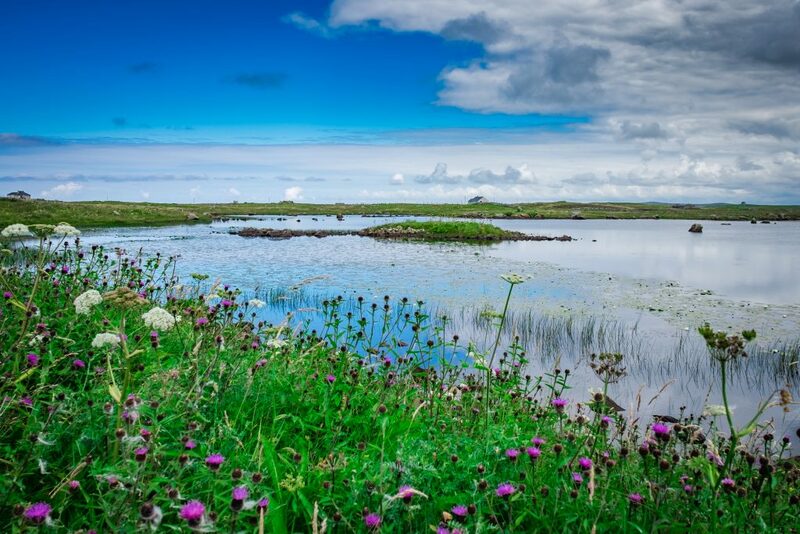 At Grogarry, turn into the Loch Druidibeg National Nature Reserve, an area of striking contrasts, where the colourful flowery machair grassland of the Atlantic coast of South Uist gradually gives way to lochs and moorland. It’s a haven for wild life and for the Eriskay ponies that roam the moor. There’s a walk to Loch Sgioport at the road end. The picturesque village of Howmore (Tobha Mor)has traditional thatched croft houses, ruined churches and a beautiful beach. The unusual village Church has a communion table running the full length of the centre aisle. From Howmore, there’s a pleasant diversion around some of the coastal hamlets of South Uist. This is an excellent cycling area and a little further south, the heritage and cultural centre at Kildonan has a museum, craft shop and cafe. 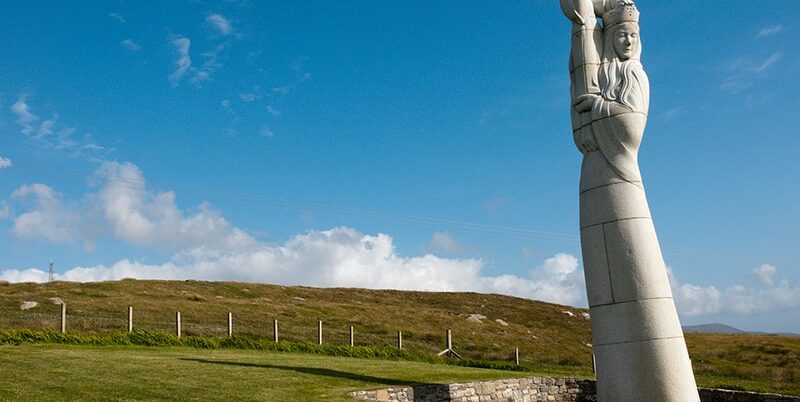 At Lochboisdale, the ‘capital’ of South Uist, there is limited shopping, plus Calmac ferries to Oban on the mainland and to Castlebay on the neighbouring island of Barra. Most of our guests will arrive or depart on using the Castlebay-Barra ferry and the small Barra/Eriskay ferry to transfer between the islands. This is an area that’s popular with our holiday guests for their accommodation before or after taking the Barra ferry. * Note: we have tested both Stepping Stones and the takeaway across the road. Both recommended.